Cosmic rays in the stratosphere are intensifying for the 4th year in a row. This finding comes from a campaign of almost weekly high-altitude balloon launches conducted by the students of Earth to Sky Calculus. Since March 2015, there has been a ~13% increase in X-rays and gamma-rays over central California, where the students have launched hundreds of balloons. The grey points in the graph are Earth to Sky balloon data. Overlaid on that time series is a record of neutron monitor data from the Sodankyla Geophysical Observatory in Oulu, Finland. The correlation between the two data sets is impressive, especially considering their wide geographic separation and differing methodologies. Neutron monitors have long been considered a “gold standard” for monitoring cosmic rays on Earth. This shows that our student-built balloons are gathering data of similar quality. In reading the solar data, what we are after in the near term is the likely month of minimum for the Solar Cycle 24/25 minimum and likely amplitude of Solar Cycle 25. Of course that quest for truth gets easier as we approach the minimum, at least apparently. 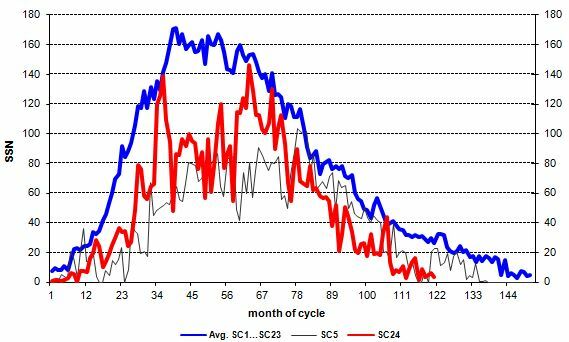 Solar Cycle 24 looks like being unusual in being short while being weak and Solar Cycle 25 looks like being a repeat of Solar Cycle 24 in terms of amplitude. The concept of the Super Grand Solar Deepest Minimum is fashionable again for the moment. There is no sign of that in the data. That said, activity in Solar Cycle 24 was back-loaded and if the solar activity to atmospheric temperature connection is real, the planet’s temperature will be running warmer for a few more years as a consequence of that.